Welcome to Triumph Christian Center. We are excited to be a part of the move of God in the North Houston, Kingwood-Porter area. It is our desire for you to have all the information you need if you are considering visiting the church. We would love to spend time with you for the purpose of getting to know you. It is our vision to see your destiny come to pass. "We're right on time, and we're here on purpose to help hurting people!" In April, 1993, a young evangelist by the name of Phil Meadows heard from God to start a spirit-filled, non-denominational church. Pastor Meadows traveled all around the area, but when he put his foot onto a parking lot in Porter, Texas, he knew he had found the home for his new church. Moving into an old, abandoned beer joint just across Highway 59 from where TCC is currently located, he started the first Sunday with six visitors and no promises. As the years passed, God not only caused the church to thrive and grow, He also opened a miraculous door to buy three acres across Highway 59 on the northbound side. With that purchased, construction began on a new church. For several years, it housed the church and a Christian school. Later, God opened another miraculous door, allowing the church to purchase the adjoining four acres. In February of 2003, construction was finished on the current Church building, and the original building became the housing for other church activities, until sold in 2016. Pastor Phil's wife, Rev. Wanda Meadows, is a vital part of the Triumph Ministry team as well. She is a preacher and teacher of the gospel, coupled with a prophetic gifting, all backed with a powerful singing voice and musical talent. Harmonizing well with her husband, together they minister in song and in the Word. Pastor Wanda has a big heart for people and the gift of administration, making her a truly invaluable asset to families and church leaders alike. She is also available as a Conference Speaker, and Evangelist underTriumphant Evangelistic Ministries. 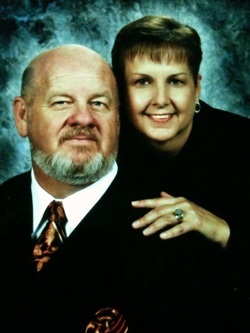 In 2008, Pastor Meadows received the call and was ordained as an Apostle. Be sure to get a copy of Pastor Phil's book, "Dunamis, God's Explosive Power". This simple, easy to understand book will give you insight into the Baptism of the Holy Spirit and His impact upon your life. The book is available in both English & Spanish amd can be ordered through our website and Paypal at the "Donations" link. Music, led by our Praise & Worship Ministers, Cindy & Danny Byrum, is a powerful and purposeful tool in the Kingdom of God. It is our desire to bring the arts back to God's glory. Praise is meant to uplift our Father, and worship is to become intimate with Him. Don't hesitate if you feel you are called to be a part of this body of believers. The Lord Jesus is your Saviour, your King of kings and Lord of lords, your kind and compassionate Friend. He helps in time of trouble. You find Him when you kneel at the cross. He paid the price so that you can have life "more" abundantly. Call us at 281-354-5683 (LOVE), ext. 10, or email triumphchristian@yahoo.com if we may pray with you. Be restored to the place God has called You to be; the place of the supernatural and miraculous.